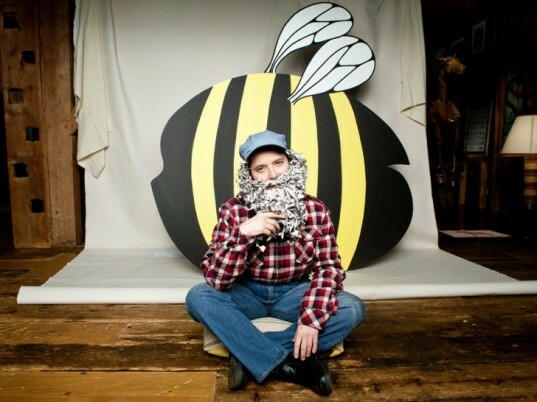 Italian actress, filmmaker and veteran insect reenactor Isabella Rossellini has teamed up with Burt’s Bees to create a thoroughly bizarre set of PSAs titled “Burt Talks to the Bees,” which look at the troubling decline in bee populations due to colony collapse disorder. Donning a paper beard, Rossellini takes the role of “Burt” himself, a real-life beekeeper who founded the company some 25 years ago, and imagines the conversations he might have with his own bee population about their plight (the bees too, played by Rossellini). The videos come just in time for National Pollinator Week, which was established by the US Senate five years ago to raise awareness of declining pollinator populations. Find out more and watch the PSAs over on Ecouterre! Italian actress, filmmaker and veteran insect reenactor Isabella Rossellini has teamed up with Burt's Bees to create a thoroughly bizarre set of PSAs titled "Burt Talks to the Bees," which look at the troubling decline in bee populations due to colony collapse disorder. Donning a paper beard, Rossellini takes the role of "Burt" himself, a real-life beekeeper who founded the company some 25 years ago, and imagines the conversations he might have with his own bee population about their plight (the bees too, played by Rossellini). The videos come just in time for National Pollinator Week, which was established by the US Senate five years ago to raise awareness of declining pollinator populations. Find out more and watch the PSAs over on Ecouterre!